I woke up feeling stiff from all that inactivity. The morning dew on the straw covering the soil of my cage tickled my whiskers. I shook my head and let out a loud growling yawn. My stomach grumbled in protest but my primary concern was my mate and our newborn cubs in the cage just next door. I lifted myself and slowly made my way to the metal fence separating us. The cubs were crawling about in the straw and pawing at their mother who was fast asleep. Their little yelps and playful cries warmed me from the wellspring of my soul. I ached to be with them but they kept us apart. Someone pulled up the small medal lid at the base of the fence and swung a large piece of cold meat inside the cage. My stomach growled even louder and I turned my attention to the puny meal I was provided twice a day. The meat was cold and tasteless. I craved for the warm occasional sunbaths in the balmy afternoon sun. I longed to feel my muscles flex and stretch as I raced across the grasslands. The caress of the cool wind as I leapt across the land is still etched in my mind. A feeling of suffocation hung upon my shoulders like an axe over my head. As the crowd of tiny human beings started pouring inside the zoo, I braced myself for the torturous day to come. Flashes of light blinded me from all sides as they took pictures of me with their cameras. I, the King of the Jungle, had been reduced to this state of helplessness. My mighty roar which made the other animals quiver in fear had become the means of entertainment to the humans. My pride was in tatters as I watched my little ones being sold out to circuses. 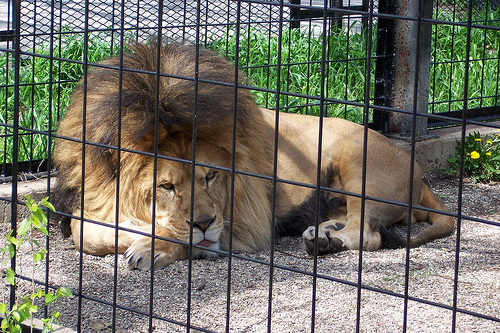 I looked ahead through the barbed fence of my cage as I pondered on my miserable existence in captivity.